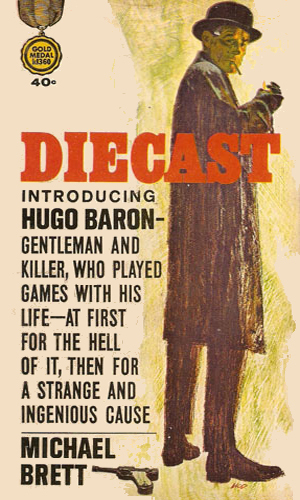 Hugo Baron is an agent for DIECAST. He is also a licensed lawyer though he was seriously considering quitting the practice of law even though he was apparently quite good at it. He is also a reporter for a major London newspaper and he is very good at that, though he did it more as a hobby than a profession. Still, it interested him. Even with these two professions to chose from, he is open to the idea of something more. As the series begins, he is not yet an agent but is a man intrigued with a requested meeting with the publisher and owner of the newspaper. The meeting was an interesting battle of two bulls but at the end, Baron had agreed to do an errand for the wealthy man. In the performance of the favor, Baron learns the true nature of the man and the fact that the man was the creator of a secret organization called DIECAST. Standing for "Destruction of International Espionage and Counter Activities for Stability and Trust", the group's existance is based on the premise that one of the greatest hindrances to world piece was the covert intelligence agencies fighting each other and spreading so much distrust. By going against every country's spy organizations, DIECAST believes, the world has a chance at peace. These organization, of course, have a less than favorable attitude towards DIECAST and its agents. Baron does not know if he believes in the cause or even if he wants to. But the excitement is real and the challenges are real and the pay is good. And it takes him out of the courtroom. 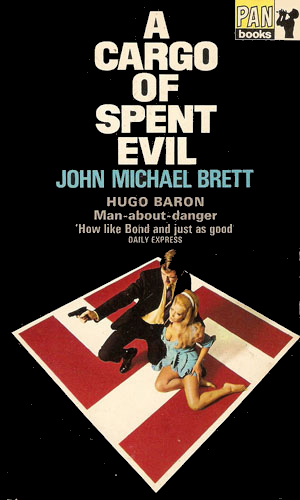 Baron is asked by the publisher of the major London paper for which he often writes to look into a blackmail scheme against the man. When Baron looks further, he finds Russian agents are behind it. Looking even further he learns the existance of DIECAST. Baron is sent to Africa where he joins from Egypt to Kenya in search of a Chinese scientist with a plan to develop a horrific germ capable of killing thousands. He also has a unique gift at brainwashing, making everyone Baron comes into contact with a potential adversary. He did not like the next assignment he was given. Baron was to infiltrate a neo-Nazi group with plans for starting a new reich. To become a trusted member, he had to take part in the smuggling of war criminals. He had a handicap while doing it - an explosive device attacked to his wrist. Boy, am I torn. These are darn good books and the character is, albeit too macho by half, still a lot of fun to follow. The concept of DIECAST is so odd and hokey, however, that I still shake my head. An organization that has as its main goal the fighting of other organizations? It wasn't really pushing its own agenda so much as making sure they did not achieve theirs. Well, I would recommend you forget that nonsence and enjoy three otherwise darned fun adventures. Hugo Baron is both sardonic and sartorial, an interesting combination. I do love a well dressed operative. I read these when I was at school and remember being deeply disappointed. I wanted my money back. 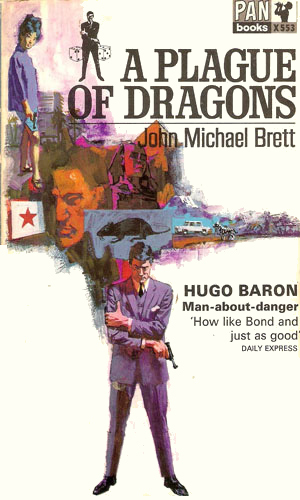 Dross is dross and these iwere the palest of Fleming imitations. A smattering of good ideas doesn't alway lead to a great series of novels. These are sub-Bond for sure, pale imitations, whose most criminal act is to lack suspense. The stories are resolved too easily. Baron has a despicable boss who at in the first adventure gambles Baron's life on the toss of a coin and in another is actually funding the villain's enterprise solely to set him up for a fall. Preposterous. Great titles though.